Congratulations! Parenthood is a wonderful experience and you will want to give your new baby the best start in life. All babies are unique and, when ready to transition to cup drinking, you can choose their perfect trainer cup with Comfort. 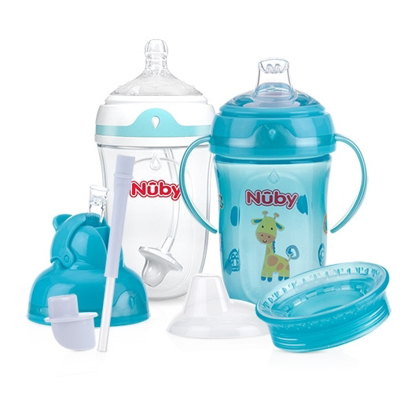 Nûby’s 9oz Comfort™ 360° PLUS+™ Trainer Cup is engineered to make handling the cup and drinking easier. It is the perfect cup for an easy transition to first cup drinking. The No-Spill™ Comfort™ 360° PLUS+™ Trainer Cup is perfect for beginners, uniquely designed with Easy Grip™ handles that are sized to fit your child's grasp and aid in the transition from bottle to cup drinking. Nûby's new 360° Straw™ allows your little one to drink easily from any angle. The innovative flexible weighted straw moves to the liquid whenever the cup is tilted, allowing your child to sip to the last drop. The ultra hygienic soft silicone spout is specially designed to prevent drips and spills while being delicate and gentle to gums and teeth. The pressure-sensitive TOUCH-FLO™ silicone spout feature regulates fluid intake with the sucking action of child. When sucking action ceases, the spout closes, ensuring a leak-resistant cup. Easy Grip™ handles uniquely designed and sized for tiny hands. Few cup parts to make assembly and cleaning as simple and easy as possible. I've searched high and low for this trainer cup, we've tried them all, not one compares! I first found this trainer cup at babiesrus that was green(which was still cute for a girl) but we lost it and haven't been able to find one since and finally thought I would go directly to the company because I need like 6 more! This cup has exactly what we need! My little girl wouldn't tip the cup back enough to get any liquid out, the weighted straw solves that issue! The soft spout is great for her soft gums, she took to using it instantly. The handles are perfect for her to grab it herself since she likes to be ms. independent! 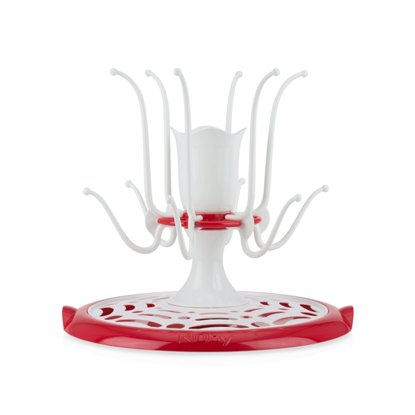 It is super easy to clean the parts, which is a must have, the colors/design are adorable too which is a plus! I just ordered 6 (in case we lose a few), I will be throwing out all the other subpar cups, I highly recommend this cup! Our daughter has an affinity for throwing cups or tipping them upside down and trying to chew on the bottom. With her other cups I would have water or juice everywhere. This is the only cup I have ever come across that truly doesn’t leak. The handles fit in her hands comfortably and it lets her drink from all angles. It does everything that it advertises and I love that it feels sturdy. Ours had been thrown across the room multiple times with not a single scratch. Very happy with this cup and I’ll definitely be buying more and throwing out all the other cups!